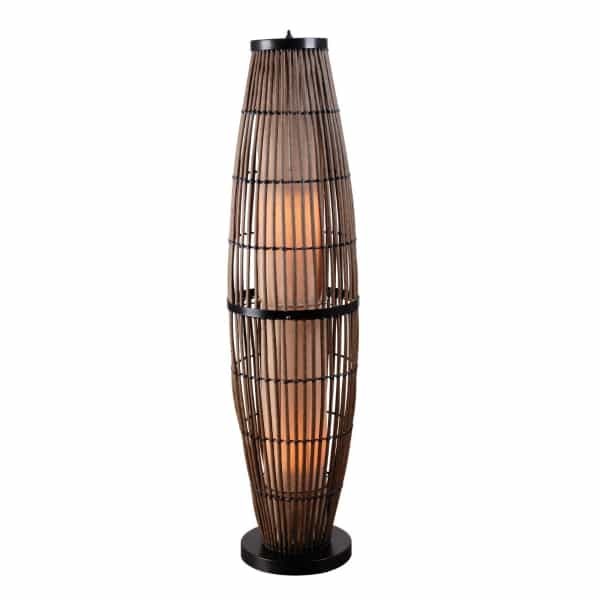 The Biscayne Outdoor Floor Lamp features a glowing pillar that radiates from inside a cage of all-weather rattan. The design mixes a dark brown rattan that mimics traditional wicker with a tanned textured inner shade to create an island style fixture. The Biscayne lighting design comes in several different lighting solution styles, including the Biscayne Outdoor Floor Lamp, the Biscayne Table Lamp, and the Biscayne Outdoor Pendant. The Biscayne Outdoor Floor Lamp aims to provide direct light to an area, and can act as general lighting that illuminates a deep seating collection or general seating area. The Biscayne Outdoor Floor Lamp has a distinct style that makes it more than just an ambient lighting source. Instead, it can act as a stylish accent piece to complement your wicker furniture or it can completely dress up your wooden dining collection.